Two coasts. Two strangers. And a bridge that silently beckons them both. 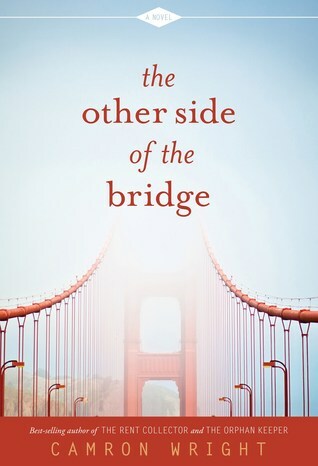 I really enjoyed The Rent Collector so I jumped at the opportunity to review Camron Wright's new novel, The Other Side of the Bridge. I've been to the Golden Gate Bridge a few times, and I found the history of the bridge that was included in this novel quite fascinating. I love that the book makes me want to do more research about the bridge. I was drawn into the story immediately. How could you not be with such an intensely emotional opening? Katie had dealt with quite a bit of heartbreak, and I really enjoyed her journey through this book as she focused her attention on finding Patrick's family, and also finding peace in her own life. I wasn't quite sure what to make of Dave at the beginning of the story. Honestly, I thought his mid-life crisis mode was going to selfishly take him from his family. What happened was so difficult and not what I expected. His journey was quite emotional, and I loved the people who helped him on his journey. The ending was a bit of a surprise for me. I guess I read too many predictable romances, because I was not expecting things to end as they did. But, it was a good ending. A little open, but definitely a happy note for our main characters. This wasn't a fast read for me, but I think that was mostly due to me moving and being swamped with all that goes along with that. Had I had more free time, I think I would have read this very quickly. But, as it was, I still found it to be a very enjoyable story, packed with emotion and likeable characters. As far as content, there are a handful of "Bible" swearwords. It took me a few chapters to get into this book. At first it just came across as disjointed, and I really didn't get what was going on. After awhile though, I really got into the stories of Dave and Katie. This book is not fast-paced at all. At times, it kind of dragged on. That being said though, I frequently found myself not being able to put it down...just one more section, just one more chapter. In fact, my bedtime was about an hour ago, and I'm going to feel it in the morning, but I couldn't stop reading when I was so close to the end. Man, this is what we should have read for book club! I'm a little disappointed that I read the other book first instead of reading this one, when I would have rather spent all my time with this lovely novel. But, I didn't know, so maybe next time. I honestly wasn't sure what to expect, but I enjoyed the Rent Collector so I decided to give it a go. Honestly this isn't my typical fluff type novel. I was bawling almost from the beginning. Each person's loss is so real and heart-wrenching. I was fascinated by the personal history of the bridge. This was a powerful and moving story that I will definitely suggest for a book club. So much to talk about and to feel.